The Austin Rover Group, a branch of British Leyland, officially launched the Rover 800 in July 1986. In the US, it was marketed in partnership with Honda and known as the Sterling. Work began on this car in the early 1980s and it was widely anticipated by the public. The two companies used different engine choices: Honda supplying a V6 petrol engine in both automatic and manual designs, while British Leyland developed the electrical systems and contributed a 4-cylinder petrol engine. The vehicle was expected to be a huge success but initial sales didn’t go as planned, especially in the UK. In 1991, the car underwent an extreme overhaul and was pulled from the US market. It went on to become Britain’s bestselling executive car in the mid-1990s. 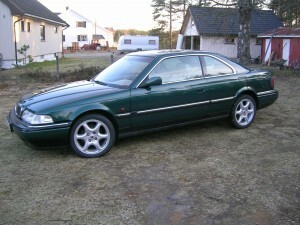 In 1996, the Rover 800 was revamped again with improvements in its appearance and engines. The look of the car changed to a sportier, sleeker version and the 2-litre engine was completely overhauled. In 1994, the Rover 800 Vitesse Sport launched, but its speed and luxury didn’t make a huge difference in the market. Finally in 1996, the KV6 engines were introduced to the vehicle and the Honda V6 was put to pasture. The 1996–1999 Rover 800 was a popular car, but few were manufactured and buyers often went away disappointed. The Rover 800 was never perfect on the roads and tended to drift on anything less than an A road, while its suspension was average at best. However, on straight, gentle motorways the car was solid and compact providing an enjoyable trip. The engine had a peak horsepower output of 175 at 6,500 rpm, and the fuel consumption sat at about 25 mpg. The main highlight of the Rover 800, which remains to this day, was its luxurious interior. The car is decorated with classy wood, leather and chrome throughout, and the stitching in the seats and doors were all done by hand. The seats were extremely comfortable with ample legroom, and it came with all the new electronics of the 90s such as electric windows and ignition, a six-stacked CD player and air-conditioning. The car was not without its problems, suffering oil leakages, blown head gaskets, electrical delays and faults, cambelts needing frequent replacement, and rust an ever-present concern. If you own a Rover 800 from this classic period but have reached the point where it isn’t financially viable to keep it on the road, give Scrap Car Kings a call. We will fetch your vehicle and scrap it with the minimum of fuss, leaving you with some money towards its replacement.